Bet you would have never guessed that goats rival horses in their speed, intelligence, and gracefulness when racing. But there really aren't any horses in Tanzania. There are, however, a plethora of goats. The Annual Goat Races have been a Dar es Salaam tradition for about the last 10 years, and we never went until this year. I think we just didn't get it. Goat Races? I mean, really. Goats...racing? Was this what you imagined? Ah yes. They have to all be followed by their "jockies" so that they go the right direction. The large blue "prod" in the back keeps them moving. Why? Because, well, a goat might just stop and decide he wants to eat the grass instead of race. But as you can see from the crowds, this is exciting stuff! Not only because the prizes are large for the winning goats, but a lot of people have bet a lot of money on these goats. All for charity though, people. All for charity. We took along Thomas, a former student, and Cecilie, a current student. It was a fun day considering that it rained about half the time and turned the entire arena into a mud pit. But really, it was still fun. Just about the cutest little Spiderman that ever was. The next couple of days after, he kept asking me, "What happened to my Spiderman face?" Grace got a little exasperated with this and responded more than once, "We washed it down the drain, Josiah!" Such a big sister. I write this one carefully. I recognize that I really am just at the beginning of this parenting journey, and don't have the experience necessary to really give definitive advice. It's been a long while since I've read a parenting book. The last couple years I've been working on my master's degree, and so all my extra reading time is taken up by that. But now I am thankfully in "Marriage and Family Counseling," which I am not only greatly enjoying, but required me to read Teach Them Diligently by Lou Priolo, a book that had long sat on my shelf waiting for me to read it. 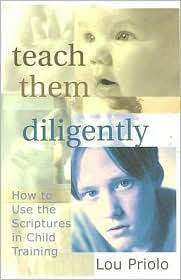 The subtitle is "How to Use the Scriptures in Child Training," which is really what this book is about. And indeed, it is a helpful, clear, excellent book. Priolo makes a very strong case for why parents need to be using Scripture when training their children. He teaches parents that not only should they be giving their children formal Bible instruction (memorization, devotions, etc. ), but also using Scripture on a day-to-day basis, in the midst of many conversations and always when disciplining. Thus, parents must know Scripture well if they expect to pass it on to their children. I was convicted. I was challenged. And I was given many practical ideas for how to implement this kind of training. But I did do some wondering. Priolo makes some pretty "absolute" type statements. "Teaching the Bible to your children is non-optional. You have been given the responsibility to indoctrinate your children with Scripture. The question is not whether or not you are going to teach God's Word to the, but whether or not you are going to obey God's Word yourself. No matter what you believe your parental job description entails, nothing else you do to, for, or with them is more important than this." I struggle with that statement. On one level, I agree with him. Teaching Scripture to my children is extremely important (and something Gil and I are indeed already doing, though could be doing more of). But I worry....what if this is the main focus of a parent, and he or she neglects equally important aspects of parenting, such as the vital necessity of building a relationship with your children? Though Priolo emphasizes that we are not to pound Scripture into our children, that we are to initiate conversations and discussion but not be preachy, and that the parent first must "practice what he preaches," I wish that Priolo had put on greater emphasis that this Scriptural teaching must be based on a relationship with our children. Let me explain. I think a parent could be extremely good at teaching her children Scripture, disciplining them with Scripture, and integrating Scripture into life's conversations and yet have very little relationship with her children. What will likely be the result? 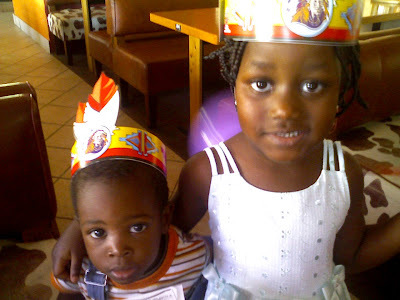 Embittered children. Against their parents and against God. We don't want to listen to people if we don't believe they really care about us. We don't want to emulate them unless we feel the love. And I think, if we're not careful, that can happen in Christian child-rearing unless we emphasize both sides of the coin. I think of my own upbringing. My parents did not follow Christ until shortly after I was born. They didn't get any lessons in "biblical child-rearing." I don't recall them teaching me Bible verses (though I do think they did so with my younger brother), but they did help me with Awana and send me to Christian school. They didn't quote Scripture when they disciplined me (which was often; I was a pretty naughty little girl!). But what they did do was build relationship with me. They spent lots and lots of time with me; we created wonderful family memories; they took time daily to talk to me on my level. They invited me into their lives. And when I got older, we discussed church and missions and theology and Scripture. All the time. I was very, very confident of their love and very much wanted to follow their example--and very much wanted to follow Christ. So I guess that could be part of the reason why I struggle with Priolo's statement that "teaching the Bible to your children....is more important [than anything else]." To take a verse slightly out of context, if I "have not love, I am only a resounding gong or a clanging cymbal." Yes! I want to teach Scripture to my children and yes! I want them to know the gospel. But if it does not come in the context of love based in relationship, I will only be clanging cymbals to my children. Ideally, both elements (Scripture and relationship) should be in parenting. But if I had to change my upbringing to where my parents emphasized Scripture but neglected relationship, I would choose relationship any day. Priolo does allude to this in his book. But I wish it was stronger, even though his book is really just a focus on using Scripture in child-rearing. Because I worry that a new parent who picks up this book and thinks that the main thing she needs to do to be a good parent is to teach Scripture to her kids, then she is mistaken. So. I now have a renewed focus on teaching my kids to memorize Scripture. I've been using it more when I talk to them. I am working at showing them how it applies to various life situations. But I am equally reminding myself to get down on the floor with them. To allow them to crowd around me when I am baking cookies, even though I get a little claustrophobic and the flour gets on the floor. To read those books and give lots of kisses. To laugh at them when they are being silly and to look at Josiah when he says, "Look at me, Mommy!" and uses his hand to turn my face towards his (which happened a couple times during this blog post!). To bring them with me to the grocery store even though it's a whole lot easier without them. Because then, hopefully, prayerfully, when I tell them, "Children, obey your parents," or "Do everything without complaining or arguing," they will listen. And it will go down into their hearts. And bring conviction. And the gospel. Less than two years ago, I wrote this about William and Stella, when they lost their first pre-term baby at 7 months. Since then, Stella has had two more miscarriages. And Sunday, she lost yet another pre-term 7 month baby. Apparently the baby was feet down and was vigorously kicking which caused contractions. Her womb opened up and the baby was born. He was over 3 pounds, but only lived a few minutes. In the process of all this, Stella was given multiple blood transfusions, one of which was the wrong blood type. I have only met Stella once but see William almost every day, since he is the head janitor at HOPAC. He is a man that is full of joy and friendliness and helpfulness and smiles. He is committed to the Lord and missional and evangelical. He is a blessing to all who know him. I am heartbroken for William and Stella and their terrible, terrible losses. I am heartbroken by the despair that must tempt them. But what makes me even more sad is that this is not unusual in Tanzania. William and Stella's loss reaches into my heart because I know them, but what about the countless other Tanzanian women who experience this daily? Stella's first baby most likely would not have died with American healthcare. I would imagine that this baby would not have died with American healthcare. Her body obviously has trouble carrying babies to term. But will she ever get the treatment she needs to help that problem? And truthfully, with all of her hemorrhaging, she is lucky to be alive. Many times we have heard of women who die in childbirth in this country. I have never heard of a woman dying in childbirth in America. I grieve for the unfairness of it all. I mourn for the pain of a mother who has lost four children, for her arms that are once again going home empty. I believe in a good God who has all things under His control, and this is not excluded. But I yearn for the Day when all things will be made right again, when there will be no more sorrow or pain or babies dying--that Day when William and Stella will get to meet their four lost children. But until then, I pray that things will change in this country I have come to love. Since there is so little I personally can do to make a difference, I pray that our students will. America is not the Promised Land. But at least mothers don't have to fear dying in childbirth. At least 3 pound babies have a good chance of survival. Imagine it was you, and pray for them today. Twinkly lights, roses, sparkling punch, feathers in the hair, great music, and of course...dancing! Last Friday night our Youth Group was transported back in time to the Roaring 20's...and what a fabulous evening we had! In Youth Group, we love our theme nights. There's not a lot of places for teens to go around here, or things for them to do, so we make up for it by putting on Theme Nights. Every time they get better. I think this one was the most fun so far. This is me and my co-leader, Carley (third from left) with our Discipleship Group. Kate and Christa (who is a naturally gifted dancer) demonstrating for the group. They all got out there and tried--even the guys! About half of the group. And of course, we had the cutest little Gangster and Gal of all....what is kind of scary is that no one asked her to pose like that. Sigh....my very own Gangster. Isn't he fabulous? And my dress....didn't I tell you? When I came out of the bedroom with the dress and the hair and the hat and the bright red lipstick...Josiah just stared and stared with those expressive eyes. Finally he said, "You look cute, Mommy!" in his two-year-old voice. Fabulous. I visited social welfare again today, for the first time in over a year. Ah, the memories. That long drive, parking down the street, walking down the sidewalks of downtown Dar, past the shoeshiners, the beggers, the deep-fried bananas, the guy with the bathroom scale that you can step on for 25 cents to check your weight. Riding the elevator to the fourth floor. Usually returning disappointed, impatient, sometimes in tears, sometimes elated. Today, I had a letter. What do you do when you know you have a costume party coming up and need vintage clothing? Go to a thrift store, of course! Since our Youth Group is having a "Gangsters and Gals" (Roaring 20's) theme night on Friday night, a bunch of girls and I headed out to the market today to find costumes. I wasn't terribly optimistic as to what we would find, but boy, did we find some gems! I know you just can't see it now, but this really is a fabulous flapper costume. (Can you believe the thrift store got rid of this fabulous dress?) Just you wait until the pictures of Friday night! It was great. We all even found matching hats--adorable hats--to go along with our fabulous dresses. Of course, it is a little awkward trying on dresses over your clothes, with four salesmen watching, all of them suggesting the next dress to try on. And of course, I did have to tell those men numerous times that, no, they cannot marry any of the girls I was with. That still didn't stop them from proposing. But what do you expect? They are indeed beautiful girls. I love the uniqueness of groups like this. One 9th grader, one 10th, one 11th, and one 12th grader. One from America, one from Denmark, one from Germany, one from Holland. All MK's. Grace asked us recently, "Can we go to the Indian restaurant?" I couldn't figure out what she was talking about. "Anghiti's? Copper Pot? Copper Chimney?" There are numerous (scruptious) Indian restaurants in Dar, but I never thought Grace would actually choose to go there. And then I made the connection: Oh, the Indian restaurant: Spur. Spur is probably the closest we get here to Applebees or Fridays or Chilis. Fully air conditioned. Slick photo menus. Padded booths. Salad bar. Even a kids' section in the back with a slide and face painting. And the food? Well, let me put it this way. If you've been in Dar for at least 6 months, the food is fabulous. If you go there only a few weeks after arriving from the States, well....not so much. As long as you stick to the burgers or steaks, you do okay. I remember, years ago, when I first went there (shortly after coming from the States) excitedly ordering "nachos" from the menu. Uh, yeah...that was the last time I ever did that. Imagine cottage cheese instead of cheddar cheese and spaghetti sauce instead of salsa...you get the idea. Anyway. The most amusing part about Spur? The theme. Just as Grace said, the theme is indeed "Indian." As in "American Indian," "Native American," or "First American"--whatever the new politically correct word is. Let me describe this in a little more detail. Spur is a South African chain. South African. With an American Indian theme. And not even politically correct American Indian. We're talking teepees, head dresses, warrior face paint, and feathered spears. The kids even get little paper Indian feather headbands reminicent of Burger King crowns.